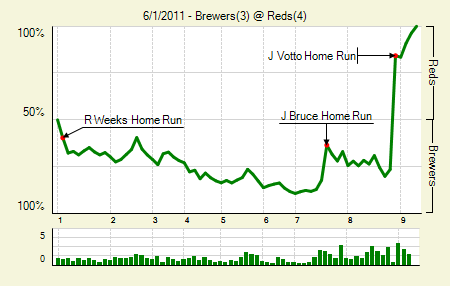 Moving the Needle: Joey Votto’s two-run blast gives the Reds the lead late, +.608 WPA. You can try to hold back the Reds, but when they have Votto and Jay Bruce hitting 3-4, chances are you’re going to get burned at some point. The Brewers jumped out to an early lead and were holding on at 3-0 heading into the bottom of the seventh. Votto single, Bruce homer. Simple as that, and it took just six pitches. Then, in the bottom of the eighth, with a runner on first and two outs, Votto annihilated a pitch. As in, it was going to dead center, but he still did the subtle bat flip at the plate. It hit off the deck well above the 404 sign. I can’t wait to see what that registers on Hit Tracker. Shaun Marcum: 7 IP, 5 H, 2 R, 0 BB, 7 K, 1 HR. When your only infraction is a homer to Bruce, you’re probably OK.
Rickie Weeks: 2 for 4, 1 HR. His homer came on the second pitch of the game, and was his 10th of the season. Moving the Needle: David Ortiz ties it up with a homer, +.169 WPA. The Red Sox did their best to avoid a sweep, jumping out to an early lead against the White Sox. But those pale hose came rallying back to take a 4-3 lead in the top of the sixth. In the bottom half Ortiz led off with a long at-bat that ended with an opposite field shot that did not at all look like a homer off the bat — a double maybe halfway up the monster, I thought. But it cleared the fence and gave the Red Sox some late life. 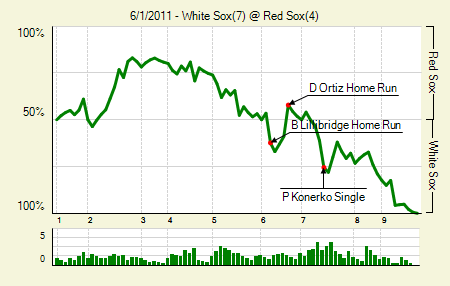 Only Paul Konerko (and the guys who got on base in front of him) turned the game back in the White Sox direction. Paul Konerko: 3 for 4, 1 HR. An RBI single in the seventh turned the lead back to Chicago, while a ninth-inning homer off of Jonathan Papelbon gave them some separation. Brent Lillibridge: 2 for 5, 1 2B, 1 HR. His six homers in 77 PA this year is double the number he hit in 298 previous MLB PA. He has 19 extra base hits in 178 PA during the last two seasons (.233 ISO). 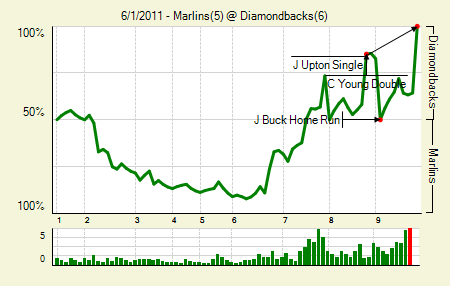 Moving the Needle: Upton bloops home the winning run, +.357 WPA. Lovers of late-inning magic would do well to watch the final few innings of this one. Down 4-0 heading into the bottom of the sixth, the Diamondbacks finally broke through against Javier Vazquez, putting three runs on the board. (They had gotten their first base runner against Vazquez in the fifth.) In the seventh they scratched across the tying run when Greg Dobbs got a little too anxious when fielding a bases-loaded chopper. In the eighth they took the lead, but in the ninth the Marlins tied it back up. That brings us to the bottom of the ninth, when, with runners on first and third with two out, Upton dunked one into shallow right, scoring Willie Bloomquist and ending the game. Ryan Roberts: 1 for 5, 1 HR. His two-run homer put them on the board against Vazquez. His homer pace has slowed — that was his first since May 15th — but he’s still been incredibly and unexpectedly productive. Mike Stanton: 3 for 4, 1 3B, 1 HR. I understand the desire to do the lefty-righty-lefty-righty thing, but it’s completely asinine to bat him behind Greg Dobbs. Then again, it’s completely asinine to hit Omar Infante second, so I’m going to skip the whole discussion of the Marlins batting order. Chris Young: 2 for 4, 2 2B. He’s 9 for his last 25 with four doubles and four walks. 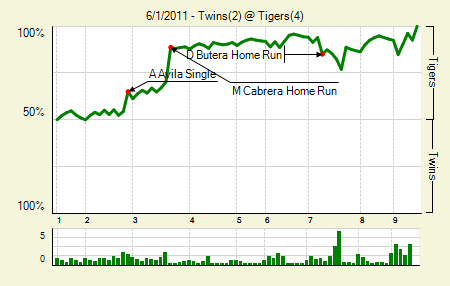 Moving the Needle: Miguel Cabrera’s three-run shot gives the Tigers a big lead, +.185 WPA. The Tigers jumped in for the kill in yesterday’s finale with the Twins. They picked up a run in the second, and then in the third they struck it big. Scott Baker walked two batters, bringing Cabrera to the plate. The pitch wasn’t all bad; it had some tail into Cabrera’s hands, which, on many batters, will induce poor contact. But Cabrera got his bat head out in front of the ball and pulled it into the left field stands to give the Tigers a 4-0 lead. Alex Avila: 1 for 3. He drove in the game’s first run. To file another batting order compaint, how is he hitting ninth and Don Kelly hitting leadoff? Managers do the darndest things. Moving the Needle: Kyle Phillips restarts the game in the second, +.180 WPA. I don’t know about you guys, but I’m always a little disappointed when the biggest WPA swing comes in, like, the second inning. 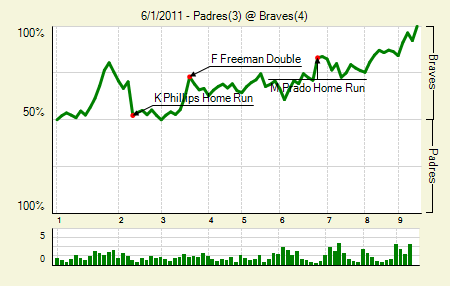 The Braves produced two runs in the first, but in the second the Padres got them back when Phillips launched a homer that barely cleared the wall in right. The tie wouldn’t last long, though, and the Braves marched on to salvage the series at home. Tommy Hanson: 6 IP, 3 H, 2 R, 2 BB, 4 K, 1 HR. He didn’t give up any hits after the Phillips homer. It took him 96 pitches to complete six, though, and so he was lifted for a pinch hitter when his spot came up to lead off the bottom of the sixth. Freddie Freeman: 2 for 4, 1 2B. Both of his hits drove in runs. 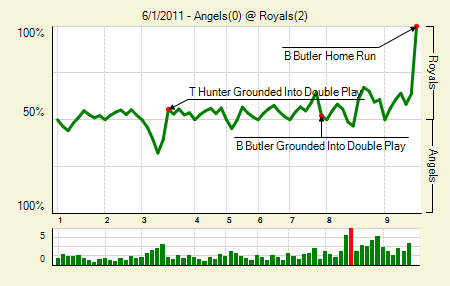 Moving the Needle: Billy Butler walks of with the only runs of the game, +.362 WPA. There were threats along the way, such as when the Angels loaded the bases with none out in the third, and then again with two outs in the eighth. But nothing came of anything. The Royals entered the bottom of the ninth with the game still tied at zero. Jeff Francoeur singled, and then Butler ripped into a Scott Downs pitch. It bounced off the top of the wall — literally, the top of the wall — and back into fair play. The result appeared to put runners on second and third, but Ned Yost asked for replay, and the umps confirmed it: walk-off home run. Awkward, sure, but the runs count all the same. Felipe Paulino: 5 IP, 4 H, 0 R, 0 BB, 4 K. I usually don’t put five-inning performances in the notables, but this was Paulino’s first start of the year. Not bad. Tyler Chatwood: 7.2 IP, 5 H, 0 R, 2 BB, 2 K, 10 GB. He’s still working on that whole thing where the number under SO is greater than the number under BB. Moving the Needle: Michael Bourn’s bases-loaded single plates a pair to break the tie, +.277 WPA. After trading runs on a pair of solo homers in the first, the ‘Stros and Cubs went scoreless from the second through the sixth. In the seventh the Astros struck, loading the bases with one out. A strikeout dampened the threat, but wouldn’t end it. Bourn, on the first pitch from a lefty brought into the game to face him, lined one to right, scoring two and giving the Astros a decent lead. They’d hold it the rest of the way. Kosuke Fukudome: 1 for 4, 1 HR. That’s his second homer of the year. His ISO is slowly creeping toward the .100 mark. 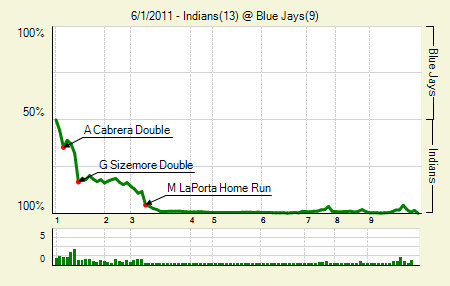 Moving the Needle: Nick Swisher’s three-run shot gives the Yanks a two-run lead, +.262 WPA. The Yankees again struck for a run in the first against Oakland, making it six first-inning runs in the three-game series. 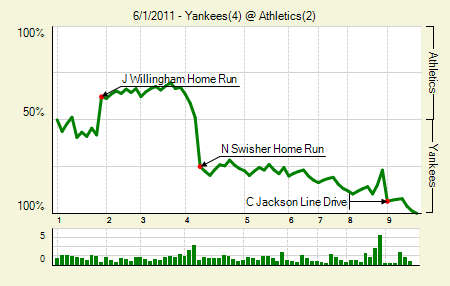 The A’s came back with a Josh Willingham homer to take the lead in the bottom half, but the Yankees weren’t done. They started the fourth with a single and a walk, and then Gio Gonzalez left one out over the plate for Swisher, who turned on it and put it over the wall in left. That made it 4-2 Yanks, a lead they’d hold through the rest of the game. Coco Crisp: 2 for 3, 1 3B, 1 BB. Three times on base for the leadoff man and nothing to show for it. A.J. Burnett: 7 IP, 3 H, 2 R, 3 BB, 5 K, 1 HR. He allowed just one base runner, the Crisp triple, after working out of some trouble in the third. Moving the Needle: Adam Jones homers to break the deadlock, +.312 WPA. 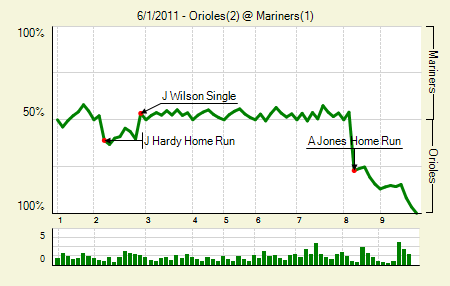 It really was Adam Jones’s game. In the fourth he made an incredible over-the-shoulder catch as he was running into the wall, which, while it didn’t save a run, was nonetheless one of the most impressive catches this season. Then, in the eighth, with the score still tied at one, he ripped an absolute pea over the left field wall. The replay angles made it difficult to see exactly where it landed, but it was a long way from home plate. Michael Pineda: 7 IP, 6 H, 1 R, 1 BB, 7 K, 1 HR. Can you imagine this Mariners team even if they had even a slightly above average offense? Brian Matusz: 5.2 IP, 4 H, 1 R, 0 BB, 3 K. It’s hard to ask more of a guy in his first start after spending two months on the DL. He was at just 84 pitches, so clearly the Orioles were exercising extreme caution with him. Moving the Needle: Ty Wigginton triples and sets up the game’s first run, +.101 WPA. It was one of those games where few runs scored, and the ones that did weren’t particularly exciting. The Rockies got two of their three on sac flies. 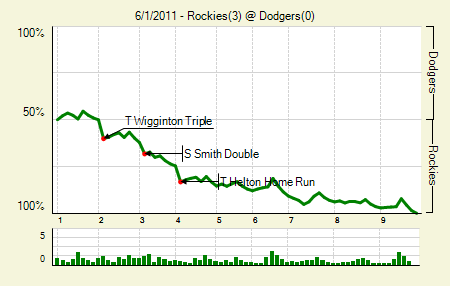 The first was set up by Wigginton, though, who tripled to lead off the second. Credit Matt Kemp with an assist; he dived in toward the ball, which so often results in disaster. Even though it got by him and to the wall, the play at third was still close. Todd Helton: 1 for 4, 1 HR. The only run of the game that didn’t score on an out? Yeah, he’s getting a notable mention. Ubaldo Jimenez: 9 IP, 4 H, 0 R, 0 BB, 7 K. And just like that, Ubaldo found his magic. 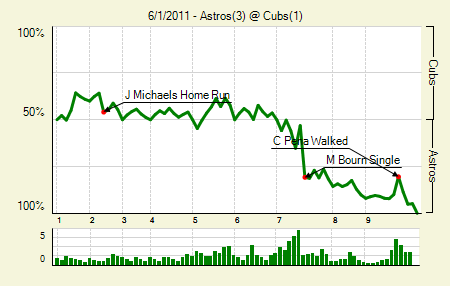 How long this lasts we don’t know, but that was absolutely from the book of 2010 Ubaldo. Moving the Needle: Elvis Andrus’s two-run single gives the Rangers a 3-0 lead in the eighth, +.163 WPA. Pitchers gonna duel, and that’s what this game brought through seven innings. 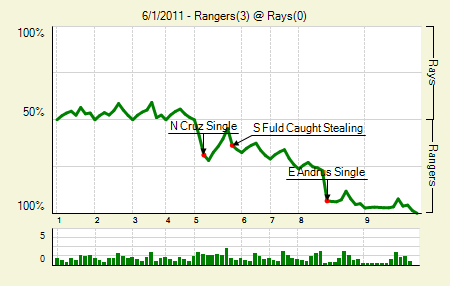 In the eighth the Rangers got a little something going after the first two batters made outs. A double steal set it up, and Andrus made it count with a two-RBI single down the first base line. Colby Lewis: 8 IP, 4 H, 0 R, 2 BB, 8 K. That got his FIP below the 5 mark, where it had, oddly, been sitting for most of the season. David Price: 8 IP, 5 H, 3 R, 1 BB, 8 K. He gets a mention, too, because an inch further away from the line and Sean Rodriguez snags it for the inning-ending out and the game is still tied. Moving the Needle: Laynce Nix breaks the 1-1 tie with a solo shot, +.128 WPA. 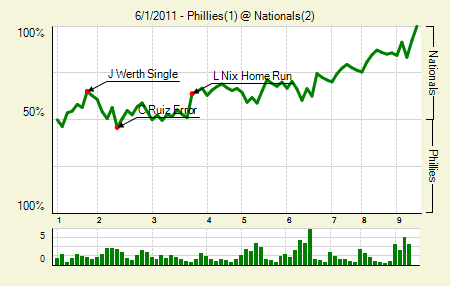 The Phils and Nats traded runs in the first and second, and then in the third the Nats took another one on a Nix homer that cleared the scoreboard in right-center. That made the game 2-1, which is, as you can see, where it ended. Pitching ruled the rest of the game, which seems like an odd notion, since neither starter completed six. Tyler Clippard: 2 perfect innings, 0 K. He contributed the most after starter John Lannan left the game with one out in the sixth. Mike Stutes: 2 perfect innings, 2 K. If I’m going to mention Clippard, it’s only fair to mention the rookie Stutes, who threw some quality innings in relief of Roy Oswalt. Moving the Needle: Grady Sizemore scores ’em all with a bases-loaded double +.153 WPA. All it took was eight batters for John Farrell to remove Kyle Drabek from the game. Of course, three of those eight doubled and three walked, so it wasn’t a completely unjustified decision. The big blow came off the bat of Sizemore, whose double into the left-center field gap plated three runs and gave the Indians a 4-0 lead. They’d tack on eight in the third, which rendered the Blue Jays’ offensive outburst moot. Asdrubal Cabrera: 4 for 6, 3 2B. That .395 wOBA? Yep. It leads all MLB shortstops. His .228 ISO is just mere points behind Troy Tulowitzki for the lead, too. Matt LaPorta: 3 for 5, 1 HR. He’s having a perfectly average year for a first baseman. Which, considering the top-heaviness at the position, is still pretty good. Moving the Needle: Ruben Tejada‘s bases-loaded single drives home two, +.221 WPA. The Mets jumped ahead in this one after loading the bases in the fourth. Tejada — how should I put this? — hit one off the handle and over Neil Walker’s head at second for a two-RBI single that gave the Mets a lead. The story of the game, though was the Pirates’ five-run seventh, which involved zero balls that weren’t within inches of being outs. 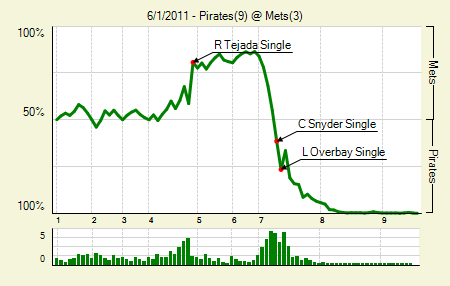 Seriously, it was the BABIP inning from hell for the Mets. Whether it was Chris Capuano not being able to pick up the ball, or a sinking liner just off the glove of Angel Pagan, the Pirates got every break imaginable on their way to victory. Kevin Correia: 6 IP, 6 H, 2 R, 2 BB, 4 K. The bases loaded situation in the fourth was the only real trouble he got into, and even there he only got beat by a bloop. Brandon Wood: 1 for 2, 1 2B. This was the only extra base hit for the Pirates. 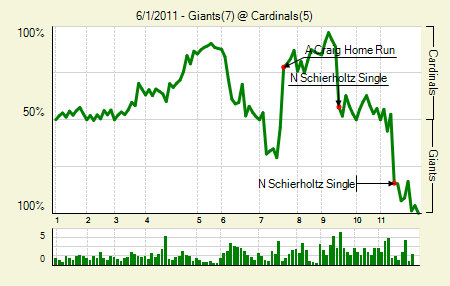 Moving the Needle: It’s all about Nate Schierholtz tying and then winning the game, +.694 WPA. Sometimes I’ll use editorial judgment and combine top plays if they came from the same player. That was the case in St. Louis last night. The Cardinals led 5-4 in the top of the ninth, and then retired the first two batters. But a walk, stolen base, and then Schierholtz’s single sent the game to extra innings. After a scoreless 10th Schierholtz again came to the plate with a runner on second, and again he brought him home. The Giants added an insurance run, just for good measure. Freddy Sanchez: 3 for 6, 2 2B. He’s having pretty much the same year as last year, which, if he stays healthy, should be just fine by the Giants. Daniel Descalso: 3 for 5, 1 3B. He hit a single in the 11th, but it was for naught. We hoped you liked reading The Morning After: Game Recaps for June 1st by Joe Pawlikowski! In the Phillies-Nats game, not only did Nix have the highest WPA, with his homer, he was responsible for the second biggest WPA game, his diving catch on Domonic Brown’s base loaded fliner with 2 outs in the 6th, worth -.121 for the Phillies.